If you visit Israel this time of year you will see Almond blossom. You can see it on hillsides, in fields and even by the roadside. Many consider it the first sign of spring. In Israel, many things you see as you travel are mentioned somewhere in the Bible. Almond blossom is certainly no exception. Almond blossom appears several times in the Bible. But, two occasions come to mind most readily. The description of the lampstand in Exodus 25 and Aaron’s budding rod in Numbers 17. Let’s look at the lampstand. The description of the lampstand for the tabernacle in Exodus chapter 25 is directly from God to Moses. This is God’s design. And here the description is particularly detailed in relation to the beautiful almond blossom we see in spring. Exodus 25: 33 Three cups made like almond blossoms in one branch, a calyx and a blossom bud; and three cups made like almond blossoms in the other branch, a calyx and a blossom bud — so for the six branches going out of the lampstand. There are further mentions of the lampstand in the Bible. 1 Kings 7 speaks of the lampstand in relation to the building of the temple. In Zechariah 4 we see the lampstand with an olive tree on either side supplying it with oil. In these verses, it is related to the rebuilding of the temple. At the end of the Bible in Revelation 1, we see the lampstand again. But this time there are seven golden lampstands and they are seven local churches. 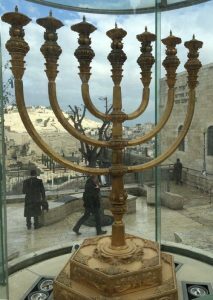 The lampstand has long been a symbol of the Jewish people. It speaks not only of Israel, but of Jerusalem and the temple. So, it is not surprising that in 1948 when the newly established State of Israel needed a national emblem they chose the lampstand. Yet, it took nine months, 581 designs, and considerable debate before the ‘Emblem and Flag’ committee could make the final choice. The lampstand has always been a symbol of the Jewish people. It speaks not only of Israel, but of Jerusalem and the temple. So, it is not surprising that in 1948 when the newly established State of Israel needed a national emblem they chose the lampstand. Yet, it took nine months, 581 designs, and a lot of debate before the ‘Emblem and Flag’ committee could choose the final design. Choosing the particular representation of the lampstand was not simple. The ‘secular camp’ wanted a modern design that stood for the democratic and socialist nature of the new state. The ‘religious camp’ wanted to emphasize the grandeur of the past and the link with God. Through antiquity, there were various depictions of the menorah (lampstand). Each ascribed with subtly different meanings and associations. So, which one to choose? The final menorah used for the emblem was based on one found on the Arch of Titus in, believe it or not, Rome. The relief on this arch shows Titus and his army returning to Rome with the spoils from Jerusalem after destroying it in 70 AD. In Rome, this picture symbolized defeat and humiliation for the Jewish people. 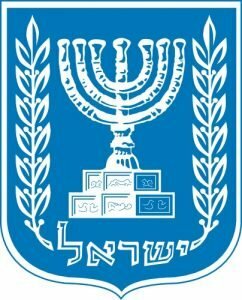 But on the new national emblem of Israel, the same menorah stood for the rebirth and restoration of the Jewish nation. The emblem is widely used on official Israeli documents, government buildings, and, of course, on an Israeli passport. This particular design also forms the basis for a menorah that you can see in Jerusalem today close to the Temple Mount. This menorah was made by the Temple Institute with the intention that it will function in the future, rebuilt temple. What is a tour really like?